Another great year had at Bristol Pride, where our Prism team were loud and proud to raise awareness of our dedicated LGBT+ alcohol and drug support service. We began the day meeting partner organisation Terrence Higgins Trust who kindly laid out a breakfast buffet of pastries and coffee, giving our team the boost they needed to join the parade. Marching alongside THT, our Prism team were joined by staff, volunteers and service users from across BDP services. With our Prism banner held aloft, proudly leading our team, we joined the Pride Parade from Castle Park marching to the Pride Festival site at Bristol Harbourside. What a load of love there was on the march! As welfare partners of Pride Day, our fantastic team were on site providing festival-goers with harm reduction advice and resources. Our team put in a lot of effort to stand-out from crowd and get in the festival spirit with a range of activities and give-aways to attract people to find out more about the work we do. It was great to be at pride festival again this year. Our stand looked very colourful and stood out, so people flocked to our stall to engage in harm reduction advice and get lots of freebies that we provided on the day. Located beside the Mersey Medical first aid team, we worked in collaboration to support lots of people who were affected by too much sun, alcohol or other drugs, and needed a quiet place away from the crowds where they could get a medical check-up and come sit and relax in our chill-out zone. Pride was a great opportunity to connect with members of the public and local community, including the Brigstowe Project and Avon and Somerset Police. It gave us the chance to introduce our Prism drop-in to people interested in reducing the harm substances cause, and family and friends who want to support their loved ones. Wonderful atmosphere with lots of engagement and people telling us how great it was to have us there. Spoke to lots of people about what Prism does and several people said they would be dropping in to speak to us at Midland road. We would like to say a big thanks to staff, volunteers and service users who helped make the day possible and represent Prism proudly, be it marching in the midday heat, or engaging with festival-goers at our harm-reduction and chill-out zone. 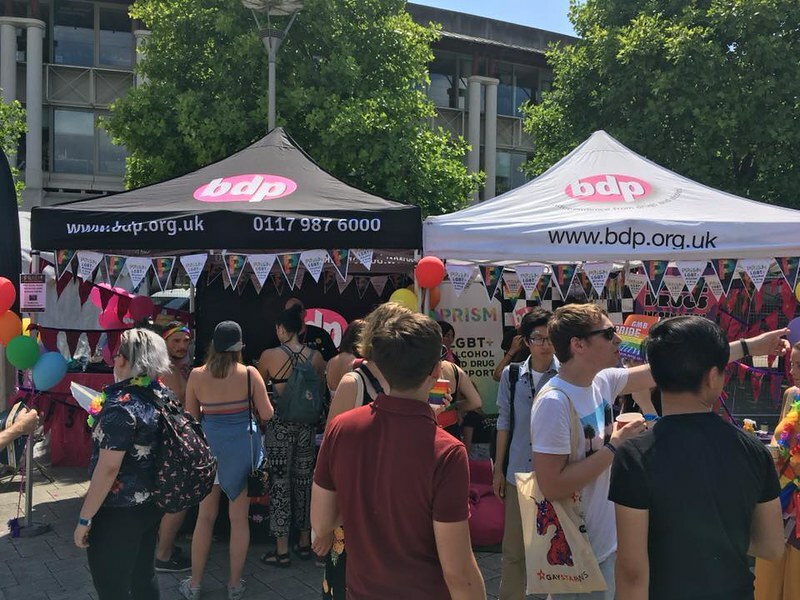 Thank you to everyone who made BDP’s contribution at Pride such a fabulous one. It takes a huge amount of planning and bodies on the day and feedback is of really good visibility of Prism, excellent harm reduction conversations and great joint working with First Aid services. Prism: LGBT+ Alcohol & Drug Support. Drop-In Mondays 5pm – 8pm at 23-25 Midland Road, Old Market Quarter, Bristol, BS2 0JT.